Brisbane, CA, U.S.A. –April 3, 2012 — GlobalEnglish Corporation (www.GlobalEnglish.com ), the leading provider of cloud-based, on-demand software to advance Enterprise Fluency™ for global organizations, today announced the results of its annual Business English Index (BEI), the only index that measures Business English proficiency in the workplace. The 2012 BEI shows that a lack of Business English proficiency is threatening the productivity of companies, industries and country-specific economies this year. With a growing number of companies operating across ten, 15 or even more than 20 countries with different native tongues, the majority of the world's business conversations now take place between non-native English speakers in English. The current shortage of talent with the aptitude to speak, present, write, sell and service customers in English has become a high-performance challenge for leaders of multinational companies at a time when more international business growth has been fueled through expansions in emerging markets. Based on a scale of 1-10, providing a ranking of employee Business English competency from beginner to advanced skills, the average 2012 BEI score across 108,000 test takers around the world is 4.15. A BEI score of 1.0 indicates an ability to read and communicate using only simple questions and statements, and a score higher than 10.0 represents an ability to communicate and collaborate in the workplace much like a native English speaker. There was an overall decrease in the average BEI score from last year's inaugural index, which dropped from 4.46 to 4.15. This low score confirms that current Business English skills are not sufficient enough to meet the performance demands of today's global economy. Nearly four out of ten (38.2 percent) global workers from 76 represented countries were ranked as Business English beginners, meaning that, on average, they can't understand or communicate basic information during virtual or in-person meetings, read or write professional emails in English or deal with complexity and rapid change in a global business environment. The majority of global workers (60.5%) from the represented countries scored between a 4.0 and 7.0, below an intermediate level, indicating an inability to take an active role in business discussions or perform relatively complex tasks such as presentation development and customer or partner negotiations. The International Monetary Fund forecasts that 70 percent of world growth over the next few years will come from emerging markets, with China and India accounting for 40 percent of that growth. By 2020, Brazil, Russia, India and China are expected to account for nearly 50 percent of all global GDP growth. Yet, according to McKinsey & Company1, only 13 percent of graduates from emerging countries are suitable for employment in global companies, and the number one reason cited is a lack of English skills. "Poor Business English skills are bad for global businesses and this year's Business English Index suggests that many companies will be hard-pressed to achieve their desired performance goals during 2012," according to Tom Kahl, GlobalEnglish President. "Addressing English skills gaps and ensuring that employees can immediately perform at the necessary proficiency level should be viewed as a strategic imperative for multinational businesses, as Enterprise Fluency, the ability to seamlessly communicate and collaborate within global organizations, can deliver significant financial upside. In fact, a Towers Watson study found that effective business communications can lead to a 47 percent higher total shareholder return." In a March 2012 report, analyst firm Bersin & Associates 3 found that organizations with a high level of Enterprise Fluency, those which tackle Business English on a strategic, enterprise-wide level, are dramatically more likely to succeed across a broad spectrum of business outcomes than companies with a fragmented and reactive business communications approach. According to the study, organizations at the upper end of the spectrum are 16 times more likely to be high financial performers, 28 times more likely to perform better on customer success measures, such as improved customer loyalty and satisfaction, and 86 times more likely to be high performers on business agility measures, including time to market and responsiveness to change. Only the Philippines attained a score above 7.0, a BEI level within range of a high proficiency that indicates an ability to take an active role in business discussions and perform relatively complex tasks. This is particularly interesting because the Philippines, a country with one-tenth of the population of India, recently overtook India as a hub for call centers.4 Joining the Philippines in the top five were Norway (6.54), Estonia (6.45), Serbia (6.38) and Slovenia (6.19). It is not surprising that both the Philippines and Norway—the only two countries in the top five in both 2011 and 2012—are improving their economies, based on the latest GDP data from the World Bank. The increased Business English capability for global workers from these two countries is an indicator of continued economic growth and business success. Both struggling economic powers (Japan, Italy and Mexico) and fast-growth emerging markets (Brazil, Columbia and Chile) scored below a 4.0 in Business English proficiency, placing them at a disadvantage when competing in a global marketplace. Three out of four BRIC countries did not attain a spot in the top-ranking 25 countries, including Brazil (2.95), Russia (3.60) and China (4.44). India earned a BEI score of 5.57, placing it within the top 10 countries. A professional services company that topped the 2012 BEI for a second year in a row with a score of 7.61 is a leading international provider of outsourced customer care. The company is differentiating itself by emphasizing the quality of its offering by enabling its representatives to provide improved service through a higher level of Business English proficiency. Both the professional services (5.19) and financial services (4.68) sectors had modest improvements to the BEI scores earned from the original benchmark index conducted last year. As business becomes increasingly globalized, client companies expect service partners to offer best-in-class support in an increasing number of geographic locations. Other higher-scoring sectors included the media/communications/entertainment sector (4.6) and the technology and retail sectors (4.5) which scored near the top of the 2012 BEI. Industry sectors at the bottom of the 2012 BEI include the government/education/nonprofit sector (3.11), the real estate and construction sector (3.15) and the manufacturing and distribution sector (3.4). 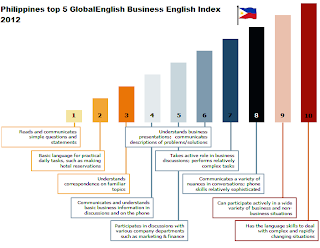 These lower results are likely due to less employer emphasis on developing Business English skills, because many of the organizations operating in these latter sectors have traditionally been more locally focused. The GlobalEnglish BEI is a valuable tool for multinational companies to measure and compare Business English competency across geographies and sectors and to evaluate Business English competency of peers and competitors. The 76 countries included in the 2012 BEI proficiency rankings each had a range of test takers between 50 and more than 13,000 per country. All global workers from 216 participating multinational corporations were evaluated over the course of 2011. GlobalEnglish offers solutions to improve Enterprise Fluency™: the communication and collaboration that drives high performance in a global economy. A key component of Enterprise Fluency is the measure of a company's ability to apply company-wide gains in Business English skills to improve the ease with which global teams can communicate and collaborate with each other and the effectiveness with which the company can operate across country borders. GlobalEnglish has more than 500 enterprises partnering with the company globally, including BNP Paribas, Capgemini, Cisco, Deloitte, GlaxoSmithKline, Hilton, John Deere, Procter & Gamble and Unisys. Its comprehensive, on-demand software solutions are available in 15 languages for instant, on-the-job support for business tasks in English – such as collaborating, writing emails and developing presentations – and proven programs for building lasting Business English proficiency. Headquartered in Brisbane, California, the company has offices in 30 countries and the global reach to support multinational companies in any country worldwide. 2 Source: The Globalization of English Report, GlobalEnglish Corporation, 2010,http://www.globalenglish.com/m/why_globalenglish/globalization_of_english/.